Sengoku 3 is in a way the third installment in the Sengoku fighter series by SNK, since Sengoku Densyo (1991) and the more marketed and enjoyable Sengoku II (1993). There was only a gap of 2 years between the first 2 games, but Sengoku 3 took its place in the industry a massive 8 years from the last sequel. Because of the fact that it took so long, some even say that Sengoku 3 is more appropriately referred to as Sengoku Legends 2001 as it is almost a whole new game environment, not just another Sengoku. Sengoku 3 is the US title and Sengoku Legends 2001 is the Japanese title. The story takes place in the modern times. As with most games, a little mishap has to take place to set the plot. In this case, a prophecy says that with the coming of a red moon over the night sky, so will great flames and the appearance and reincarnation of the Timeless Soul. And hence, a big catastrophe hits the world that no normal man is capable of stopping. The solution ; get the professionals. The prophecy also speaks of the Ninjas of Peace, a team of ancient warriors dedicated to the coming of this event and putting an end to the catastrophe. They would be the characters you have in the game ; the male samurai Kagetsura, female counterpart Kurenai, blonde Spanish knight Falcon and the monk Kongoh. They are not exactly the local people turned heroes like most other superheroes are. They in fact have remained dormant in their little ice (cryo) chamber awaiting the moment for when they were needed (screens of these events can be seen in the game intro). So the game will take the Ninjas of Peace fighting through various locations all over the world, to attempt to stop the reincarnation of the Timeless Soul and then save the world (you guys saw that coming didn't ya ?). Like its predecessors, Sengoku 3 is a 2D-scrolling cooperative fighter. It also has all the common aspects of fighter games of these sort such as life bars, items, food, bosses, a choice of characters and distinguished powers and heaps of baddies. Special features of the game would be perhaps a combo system and its range of character powers to execute in the game. 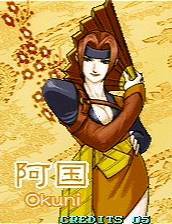 Sengoku 3 starts off with 4 characters to choose from. You will have the option of re-selecting your character once you have completed the first 3 stages (there is no real sequence as you can choose to attempt them in any order you like � see Stages section on page 3 of this review). At this stage, you will also be able to select from an additional 2 more characters, who were bosses in the first 3 stages, eventually joining your force (typical, first they go against you, then when you're winning, they join you). A Japanese samurai with right eye patched, uses a samurai blade or ‘katana' and the power of lightning through the “Ninja Arts of Shock”. His battle suit is dark blue with a red scarf and a pony tail (cute). The only information on his background I have is, that his name bears a certain similarity to a famous legendary samurai in ancient Japan ... Kaget'something'. His speed and strength are at moderate levels compared to the other characters among the Ninjas Of Peace. So he'd be an in-between choice among them. The blonde Spanish knight of the team. 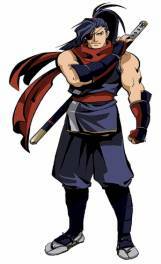 He bears a one-handed sword with him in battle, and uses the �Ninja Arts of Fire' along with his quick slashing moves. 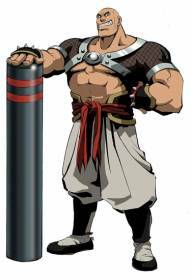 It's common for most samurai-style origin games (think Samurai Showdown/Spirits) to have some help from their comrades in the west, so Falcon would be that guy. He was a navigator who's ship sanked and was rescued by a fellow ninja when we was washed to the shores of Japan. There, he learnt the ways of the ninja. 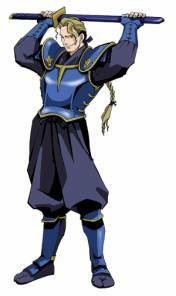 His speed is above average but lacks the strength compared to his eye-patched samurai counterpart. However, his speed makes him a definite favourite to play the combos in the game. 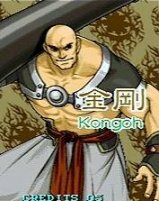 A bald, massive japanese monk with an attitude, an a really big iron staff, no normal man is capable of lifting. His powers evolve around making use of his magical iron staff and his strength. The name has a certain link to that of a Japanese monk, as well as the 4 golden protector gods �Kam Kong�. The iron staff he uses looks like some kinda temple ornament but it's able to do a lot more damage. This religious warrior works his way through his foes slowly, but with a whole lot of brawn put in. He is the slowest among all, but takes 2 to 3 moves less to finish of an enemy compared to his counterparts. The female samurai, bearing double blades and with a cute japanese cartoonish look on her. She uses the power of the �Double Blade Arts� and nature winds. 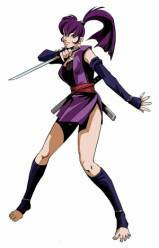 She takes on the bad guys with a purple theme to her fashion, and red to her name. 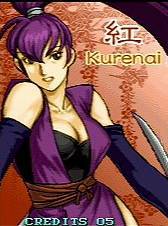 She's Kagetsura's childhood playmate and bethrothed wife but she didn't agree with the arrangements. Her speed is the fastest among all the players but is also the weakest. However, with that speed, she has little trouble moving up and down enemies keeping them just as busy. He is the boss of the Japan stage, who joins your force after you have completed all the 3 first stages. 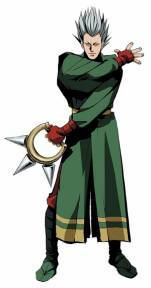 A cool hairstyle and bearing a spiked wheel as his battle tool, he is one of the favourites. He employs the �Ninja Arts of Darkness�, which he summons to assists him in battle through his special moves and ninja arts skills. He was banished from Kagetsura's clan for attempting that art, and was also framed. Really cool in action, plus he can do combos with the help of his dark pets. Also known as the �White Ghost�. His speed and strength are once again moderate, with a little more emphasis on his strength. He also has a further span of attack when he throws his spiked wheel like a boomerang. The boss of the Italy stage, who's in the same situation as Byakki. Once again only enabled after completing the first 3 stages. She on the other hand uses a more graceful looking Japanese war fan or a �gunsen', but can still cause heavy damage. She's a leader of courtesans who developed a deadly dance move. 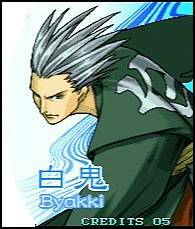 When Byakki left the clan, Okuni believed that Byakki was framed and tagged along. If you're wondering, in this game who'd be the Mai Shiranui (since this is an SNK product), you're looking at her right now ... nuff' said.